Director of collection: Baker David C.
Advances in Carbohydrate Chemistry and Biochemistry, Volume 74, presents a definitive interpretation of the current status and future trends in carbohydrate chemistry and biochemistry. 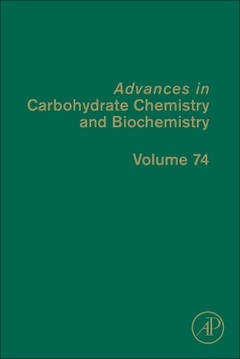 Since its inception in 1945, the series has provided critical and informative articles written by research specialists that integrate the industrial, analytical and technological aspects of biochemistry, organic chemistry and instrumentation methodology to the study of carbohydrates. Researchers in biochemistry, organic chemistry, medicinal chemistry and instrumentation methodology.